Fixed bug in loading of product pricing metadata, introduced by an incorrect patch in version 3.6.13.140122. The bug caused some product prices to be displayed as “Free” even when they actually had a price set. Irony: the code that caused the bug was written by our experienced founder, who made a very “junior” mistake this time. Working too much is not good for you! Fixed conflict with our Subscriptions Integration plugin. The conflict caused a notice message to be displayed on Subscription products, and could cause a “chain reaction” of messages that could lead to a fatal error. Removed Product Base Currency feature from variable products. It was a difficult decision, but we had to disable such feature, that we recently introduced, because we discovered some limitations in WooCommerce architecture that prevented it from working correctly when used on variable products. We tried to rewrite the new feature several times, taking different approaches, but the result was always an overly complicated hack that caused performance issues. 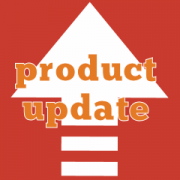 Because of that, our only option was to temporarily disable the Product Base Currency on variable products, and leave it only for simple products.We will now contact the WooCommerce Team to suggest some ways to improve the ecommerce core, so that we can enable the feature again in a future release. If you would like to have more details about the issue and the reasons behind our decision, please feel free to contact us. Fixed bug related to the integration with Prices by Country plugin. The bug caused the prices specified for a region to be discarded and overwritten by the base ones in some circumstances. Added Yahoo! Finance to the available providers of exchange rates. Improved admin UI. The message stating importance of entering proper exchange rates is now more prominent. Following a report from one of our customers, we reviewed the product base currency feature that we introduced recently, and we discovered that it may not always work for variable products. The new feature allows to set the base currency for simple products and product variations, and enter their prices in such currency. All the prices in other currencies, if left empty, are calculated automatically. This new logic, which works correctly in all cases with simple products, fails if variation prices in base currency are left empty (see screenshot below). This is due to how WooCommerce loads the variations, and it results in variation prices to be displayed as zero. We tested the new conversion, using product base currency, in multiple scenario, and it works consistently. However, there is a limitation in WooCommerce architecture that doesn’t allow the dynamically calculated prices to be used when determining the price of a variable product. The Currency Switcher converts all product prices dynamically in the appropriate currency as soon as they are loaded. The variation base prices, even if left empty, are populated on the fly. 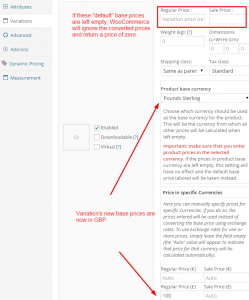 However, some parts of WooCommerce ignore these new prices and load the “raw” ones directly from the database, bypassing our currency conversion mechanism entirely. Let’s take a variation configured with USD as the base currency, a base price of 100 USD and its “standard” base prices, in EUR, left empty. When the variation is loaded and EUR is the active currency, the Currency Switcher replaces the variation price with 86.65 EUR. 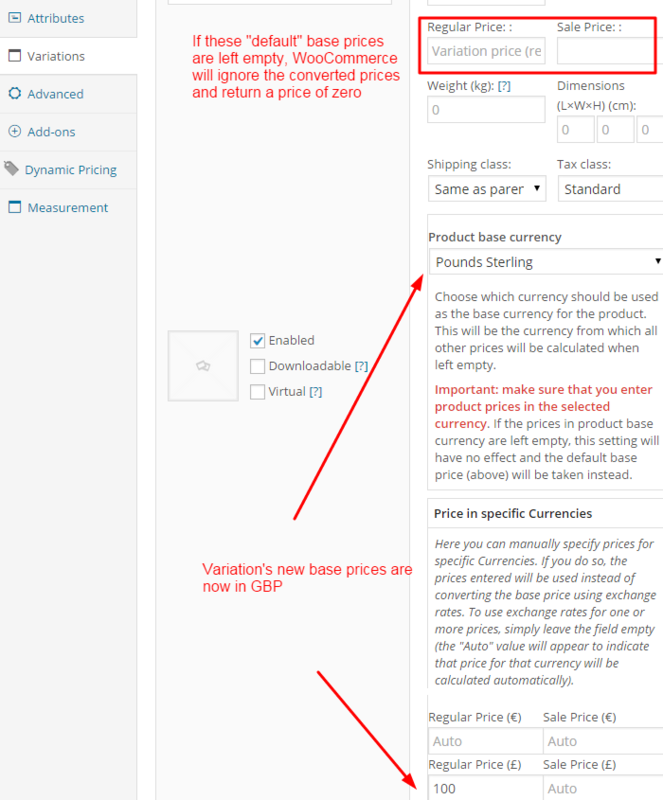 This is the correct behaviour, and it works almost everywhere, except in some (unfortunately, critical) cases in which WooCommerce will just load the variation base prices directly from the database, thus loading “blank” and considering the variation “not priced“. 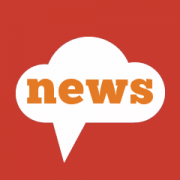 We are still working to fix the issue and we will release an update as soon as possible. In the meantime, a workaround is to ensure that variation prices in WooCommerce base currency are always populated. We are aware that this defeats the purpose of the product base currency feature, therefore we are giving this fix the highest priority. Should you need further information or assistance, please feel free to contact us using our dedicated support portal. Thanks for your patience, and apologies for any inconvenience caused. Fixed bug in handling of incorrectly configured product prices. The bug occurred when a product base currency was set, but the corresponding prices were left empty (e.g. when a product base currency was set to EUR, and the EUR prices were left empty). The bug caused the product price conversion to fail, showing the products with the same price regardless of the active currency. Our Tax Display by Country became even more powerful! Version 1.7.0.150109 of our WooCommerce Tax Display by Country plugin will become available soon on CodeCanyon. This new version implements a new, powerful feature that was requested to us by several of our customers: the possibility to keep product prices fixed, including tax regardless of what tax rate applies to a customer. As most WooCommerce users know, when prices are entered including taxes, WooCommerce considers those prices as “inclusive of the taxes that apply to shop’s base location.” For example, if your shop is based in Ireland, a product priced 100 Euro will be considered inclusive of 23% Irish VAT. When a customer from Germany (19% VAT) will buy such product, the price he will see will become 91.63 Euro, calculated as 100 Euro – 23% Irish VAT + 19% German VAT. This calculation, while correct, produces all sorts of different amounts. In some cases, it would be better to be able to show a price of 100 Euro to all the customers, and calculate the tax-exclusive price from it. WooCommerce, by itself, does not allow to do that. Luckily, our WooCommerce Tax Display by Country plugin comes to the rescue, by implementing such a feature for you. By enabling a single option in its settings, you will now be able to keep all product prices fixed, regardless of what tax applies to the purchase. Fantastic! When is this feature going to be available? We already submitted the updated plugin to the CodeCanyon marketplace. You can expect it to become available at any time from now. Ensured that region names are always populated. Required fields can no longer be left empty. Added logic to remove invalid regions (i.e. the ones without a name or a list of countries). Improved fault tolerance. The plugin now handles the case in which the wc_aelia_cs_enabled_currencies filter returns an invalid list of enabled currencies. This should never occur, unless an old version of the Currency Switcher is running. Please refer to the latest Currency Switcher update for more details.